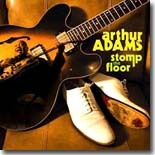 Stomp The Floor, the latest release on Delta Groove Music by guitarist Arthur Adams, will certainly please fans of old school R&B and blues. Adams got his start in the music in the late ’50s as a teenager when he hooked up with tenor saxophonist Jimmy Beck’s band in Nashville. The Tennessee native ended up in Dallas, where he recorded a few R&B singles and worked on his guitar chops, incorporating jazz melodies into his already prestigious repertoire and honing his songwriting skills. He ended up in Los Angeles, where he enjoyed a productive stint as a session musician and contributed to numerous movie and TV soundtracks. In the early ’90s, Adams contributed a couple of songs for B. B. King’s There Is Always One More Time album, and spent ten years as house bandleader in King’s Blues Club in California. King also appeared on Adams’ 1999 Blind Pig release, Back On Track. Though Adams has enjoyed success in numerous musical genres, he’s settled comfortably into the blues genre with his most recent releases, but he never strays far from his other influences. Stomp The Floor consists of 12 tracks, all originals either written or co-written by Adams. The band includes a tight horn section (Lee Thornberg – trumpet, Dave Woodford – saxophone, Garrett Adkins – trombone, plus several session guys whose names will be familiar to R&B fansin Reggie McBride – bass, Hense Powell – keyboards, James Gadson – drums). Adams is right up front with his guitar work, which ranges from scorching blues to silky smooth R&B, and his sweet soulful vocals. Highlights include the urban blues tracks “You Can’t Win For Losing,” “Nature Of The Beast,” and “I Know What You Mean.” “Don’t Let The Door Hit You” sounds like a great fit on a future B. B. King disc, and songs like “So Sweet” and “Thrive On Your Vibe” recall Adams’ R&B days. There are also three splendid instrumentals that put the focus on his guitar work. “You Got That Right” and “Around The Sun” are both reminiscent of the relaxed mid-’70s jazzy funk of George Benson, and “Blues Roots” is a straight-ahead blues groove. Though he’s been a working musician for over 50 years, Arthur Adams has appeared far too few times in the studio as a frontman during that span. His smooth, sophisticated approach to the blues is a treat to hear. Consider Stomp The Floor to be the best of an impressive, but sparse catalog and hope that it leads to more recordings for this underrated artist.